The latest edition of the Can-West Iris Society newsletter Aurora is now available on the Newsletters page. It includes further details on their upcoming meetings. Among these are Chuck Chapman‘s presentations Iris Through the Seasons and Breeding for Cold Climates on Sunday, April 21st. The Greater Omaha Iris Society Iris Show will be held Saturday, May 11th at the Douglas/Sarpy County Extension Office at 8015 West Center Road in Omaha. Open to the public at no charge from 12:30 to 4:00 PM. 1-1/2 hours of Judges training will be offered during the show. Exhibitors: Entries accepted from 7:30 to 9:30 AM. Iris entered in the Horticulture Division must be correctly identified as to variety name and grown by the exhibitor. Arrangements may also be entered in the artistic design division. An exhibitor may enter only one exhibit per class, but may enter as many classes as desired. Judging will be done by judges of the National Council of State Garden Clubs and/or The American Iris Society. 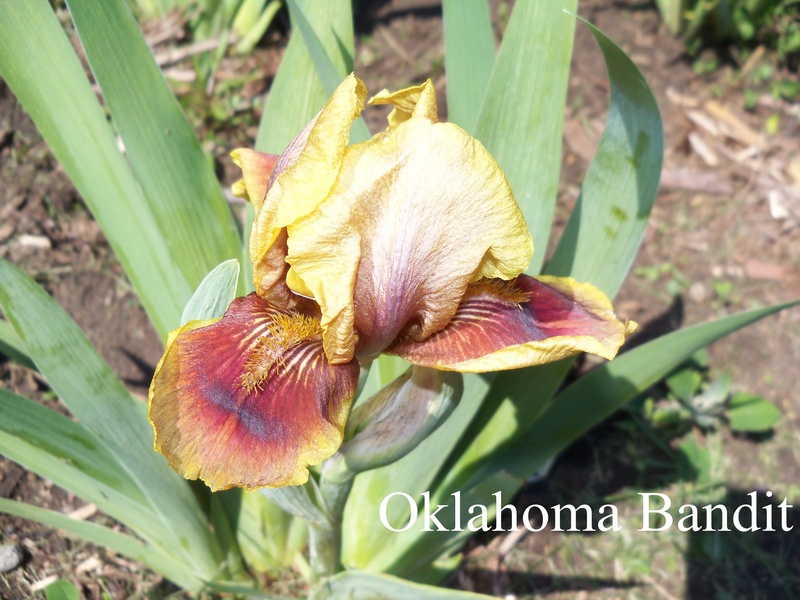 The Greater Omaha Iris Society has a busy schedule this year! See their front page for meetings and work days. Their next program is Median Iris. Find out about the ‘other’ iris; the iris world includes the STBs, MDBs, MTBs, IBs, and BB. We’ll decipher all the alphabetic terms for you; hint – the letters describe the iris! The meeting is 6:30 p.m. at the Douglas/Sarpy County Extension office at 8015 West Center Road in Omaha. Interested in becoming part of new AIS affiliate in central Iowa? Contact wrmesser@gmail.com for more information. 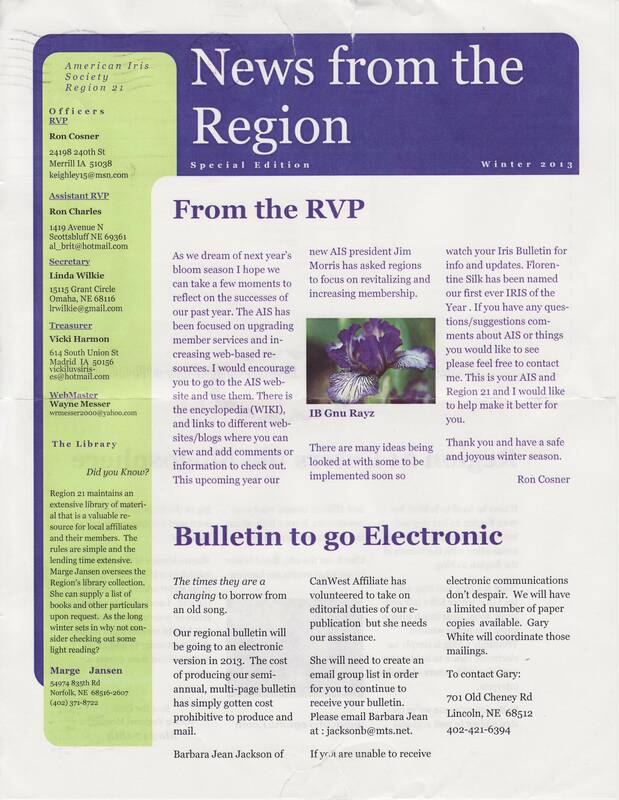 Members of Region 21 should already have received the Winter 2013 edition of News from the Region our newsletter. 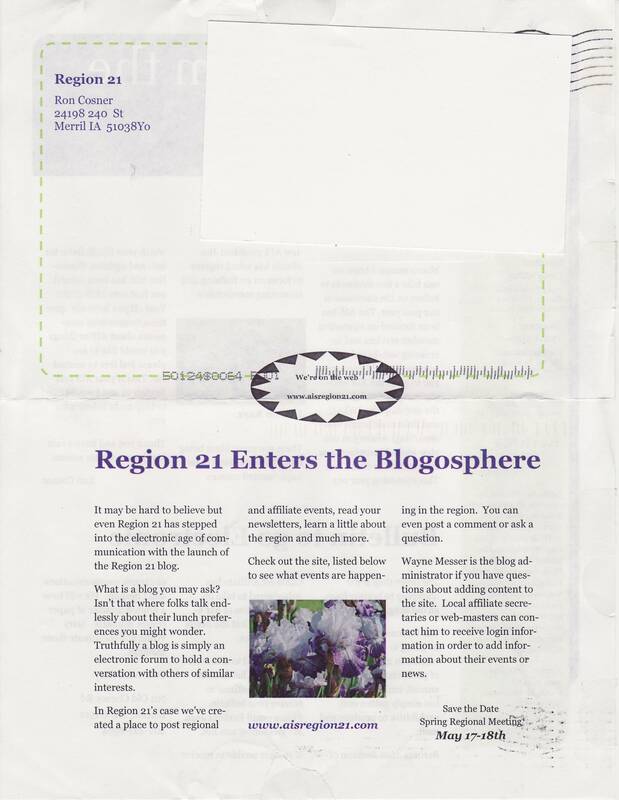 In case you missed it, or are have not yet joined the American Iris Society (to become part of Region 21), here it is. You can see it on the left (click on the pictures to see larger versions) or download it here. 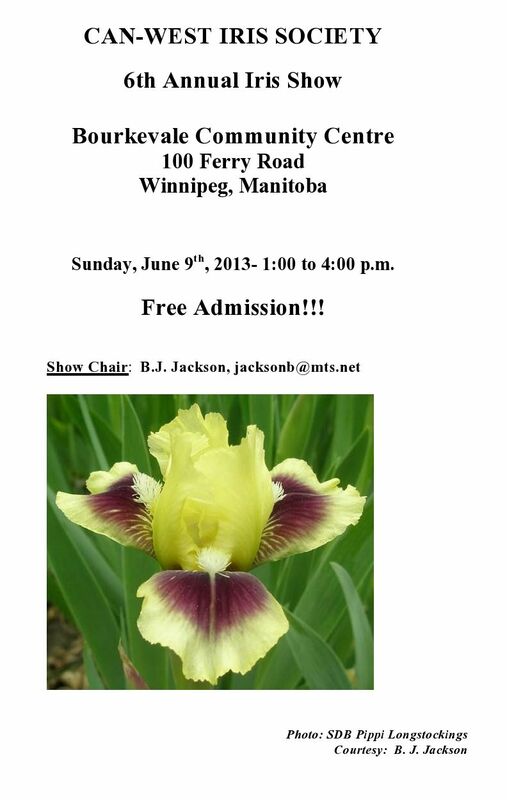 The Can-West Iris Society 6th Annual Iris Show will be Sunday, June 9th, 1 – 4 p.m. at the Bourkevale Community Centre, 100 Ferry Road, Winnipeg, Manitoba. Free admission!